Here’s a few photos of last week’s class at Aspenz Cooking School, Bunbury Western Australia. I had some problems publishing the photos. All fixed now. Our first tasting was moghul-style cumin infused basmati rice, made all the more fragrant with fresh ginger, cloves and cinnamon, some raisins and fresh green peas, and a drizzle of ghee. 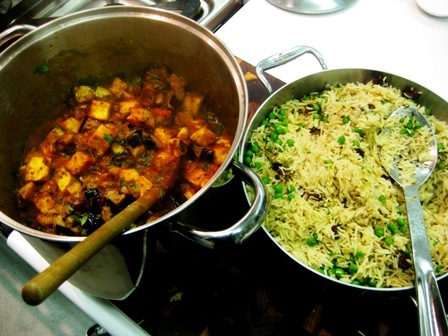 Alongside that we served a dish of eggplants and fresh cubes of roasted panir folded through with a spicy reduction of tomatoes and green chilies, and just a hint of garam masala. I drizzled olive oil and sea salt on crispy cauliflower florets and oven-roasted them until golden and fragrant. Then I stir-fried and briefly steamed some snow peas, folded through the cauliflowers, sprinkled on a spray of freshly-cracked black peppercorns, drizzled in some sweet chili sauce and a dollop of sour cream, strew some fresh coriander, and there was our second tasting for the evening, served with hot poories. 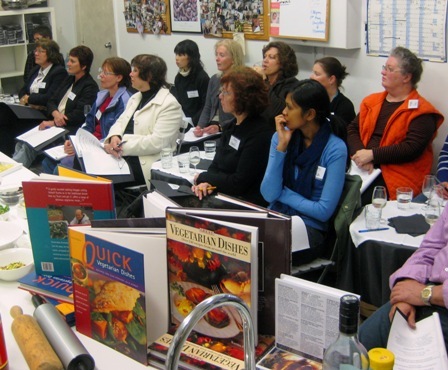 All the while our class were in rapt attention, enjoying, learning, feasting and laughing, and finally buying cookbooks by the dozen.